Can a Love of History be Contagious? I have a confession to make: I LOVE HISTORY! As a high school student, my favorite subjects were history and English. I am particularly fascinated by stories about brave souls who lived bold lives following Christ. When I hear about one, I spend hours scouring various resources to learn more about the world in which he or she lived. Of course, I know not everyone loves history as I do. As a homeschooling mother, I have noticed through the years that my children are not drawn to history as naturally as I am. As a Sunday school teacher, I have sometimes endured blank stares when I enthusiastically share historical tidbits. Recently a friend of mine was visiting for the weekend. She is a physician's assistant, and we talked for hours about her love of science. While I do not quite understand her passion for science, I concluded that day that God wires all of us differently! Understanding now that God puts varying natural desires within each one of us, I still believe history is a vital aspect of education. From a biblical point of view, over and over again in the Old Testament God encourages—even commands—His people to recount their history, to teach it to their children, to consider “what great things He has done” for them. This was the inspiration for them to continue obeying and following hard after YHWH. So, how do I stir a love for history in my children and students? Recently, I have developed a growing love and appreciation for Vision Video's The Torchlighters series. Just tonight, my family gathered around to watch The William Tyndale Story. We learned a little bit about the Protestant Reformation, Henry VIII, Anne Boleyn, Cardinal Wolsey, and the Holy Roman Empire. We were reminded of the vital importance of the Word of God in the hands and hearts of men. We were inspired by Tyndale's story of boldness and faith. By the end of the video, I was confident that my children were beginning to grasp the significance of Tyndale's life and service to God in his time as well as ours. Now my children want to know more! 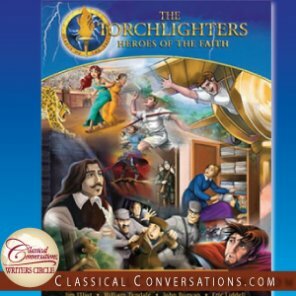 The Torchlighters dramatizes the lives of Christian men and women throughout history whose choices have made a significant impact on those around them and those who came after them. The videos not only introduce children to historical eras, Christian heroes, and fun stories, but they also give these moldable, precious hearts deep thoughts of godly things, inspiring tales of forsaking all and following Christ, and a thirst to let God work in their own lives. My children now beg to watch the videos when they are finished with school for the day (or when they haven't finished school for the day)! I love being able to converse with them about these events in history and how they can impact our lives. I love that it is time NOT wasted. I love that I can see God planting seeds and working in their hearts through this series! The Torchlighters is more than just a series of cartoon videos. The DVDs offer an amazing amount of additional resources, including a bonus video for parents, leaders, and older students documenting further the life of the main character in the story (about forty minutes). The Tyndale video also has an inspiring interview with the main actor. I can't wait for my nine- and ten-year-old to watch it soon! Another incredible resource included on the DVDs is the study guide. The Leader’s Guide for teachers/parents is close to twenty-five pages. It includes lesson plans for four sessions, craft projects, a detailed overview of the main character, and an additional resource list. The study guide for the student is around fifteen pages. Children of varying ages and levels are sure to stay interested with coloring pages for the littles, colorful worksheets for the intermediates, and engaging activities for the advanced students. As a homeschooling mother of five, a children's Sunday school teacher, and a busy children’s ministry director's wife, I consider The Torchlighters an incredibly valuable tool. Whether it is letting my kids take a break to watch a video, making our history lessons more beneficial and enriching, or utilizing the stories in Junior Church, I look forward to delving into this inspiring series as we go along this school year! Karen Chapman is a homeschooling mother of five. Her children’s ages range from preschool to middle school. Karen also assists her husband, Forrest, who is the Children’s Ministry Director of Calvary Baptist Church in Lansdale, PA. She also travels with her husband, a highly regarded camp speaker for children and teens. For over 40 years Vision Video has produced and distributed outstanding Christian visual media resources. Selections include drama, documentary, children’s programs, live events and curriculum. Vision Video offers thousands of programs on DVD and digital media as well as through television distribution. The programs they offer have won close to four hundred film festival awards. Vision Video’s goal is to nurture, encourage and inspire faith in every age. Learn more at https://www.visionvideo.com.